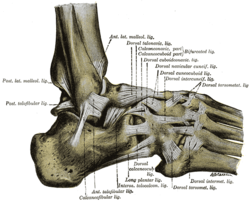 The calcaneofibular ligament is a narrow, rounded cord, running from the tip of the lateral malleolus of the fibula downward and slightly backward to a tubercle on the lateral surface of the calcaneus. 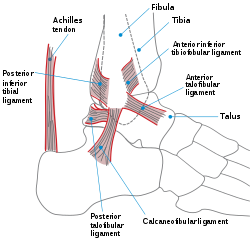 It is part of the lateral collateral ligament, which opposes the hyperinversion of the subtalar joint, as in a common type of ankle sprain. It is covered by the tendons of the fibularis longus and brevis muscles. ^ Moore KL, Dalley AF, Agur AM (2013). Clinically Oriented Anatomy (7th ed.). Lippincott Williams & Wilkins. ISBN 978-1-4511-8447-1. Matsui K, Takao M, Tochigi Y, Ozeki S, Glazebrook M (June 2017). "Anatomy of anterior talofibular ligament and calcaneofibular ligament for minimally invasive surgery: a systematic review". Knee Surgery, Sports Traumatology, Arthroscopy : Official Journal of the ESSKA (Review). 25 (6): 1892–1902. doi:10.1007/s00167-016-4194-y. PMID 27295109. 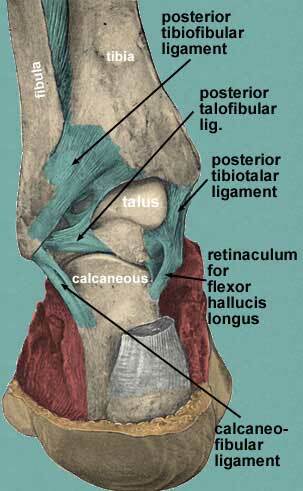 This ligament-related article is a stub. You can help Wikipedia by expanding it. This page was last edited on 27 November 2018, at 00:04 (UTC).